Miyazaki Prefecture (宮崎県, Miyazaki-ken) is a prefecture in the Kyūshū region of Japan on the island of Kyushu. The capital city is Miyazaki. After the Meiji Restoration, the area of Hyūga Province was renamed Miyazaki Prefecture. Miyazaki is famous for various foods such as meat and fruit. Miyazaki Prefecture is on the eastern coast of the island of Kyūshū. The southeast coastline faces the Pacific Ocean. Ōita Prefecture is north of Miyazaki. Kumamoto and Kagoshima Prefectures are to the west. National parks are established in about 12% of the total land area of the prefecture. Miyazaki is one of only two locations on Earth where the fungus Chorioactis geaster lives. Tsuno jinja is the main Shinto shrine (ichinomiya) in the prefecture. ↑ Nussbaum, Louis-Frédéric. (2002). 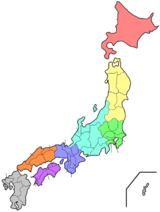 "Miyazaki prefecture" in Japan Encyclopedia, p. 651; Japan External Trade Organization (JETRO), Miyaszaki Prefecture, Regional Information; retrieved 2012-4-6. ↑ Nagao H, Kurogi S, Kiyota E, Sasatomi K. (2009). "Kumanasamuha geaster sp. nov., an anamorph of Chorioactis geaster from Japan". Mycologia 101 (6): 871–877. doi:10.3852/08-121. PMID 19927753. This page was last changed on 16 July 2018, at 01:47.